"Julia Bouwsma's chilling tale of the quietus of Malaga Island is shattering in its simplicity. The ease with which an 'undesirable' culture can be summarily disappeared is not a grim aberration relegated to a long-ago past―it’s a monster of the here-and-now. This is a chilling commentary, compassionate and character-driven, penned by a poet who is resolute and relentless as witness." 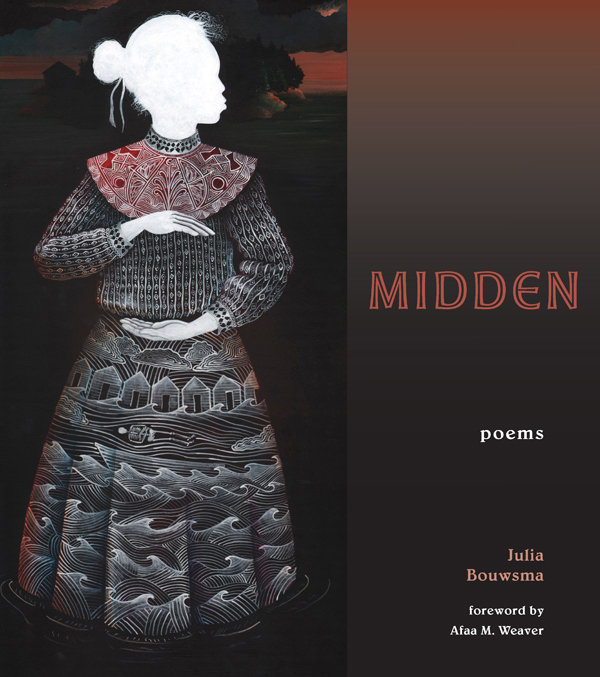 "Vividly reimagined and gorgeously rendered, Julia Bouwsma’s Midden gives voice to the citizens of Malaga Island, off the coast of Maine, who early in the twentieth century were removed from their homes, their lives destroyed. Bouwsma writes, 'I tried to write the island / to life.' In this devastating and beautiful collection, she does just that, as she expands the field of documentary poetics. These poems bear witness to the tragedy of Malaga Island and demand that we remember our country's violence to people and land. Julia Bouwsma’s voice is eloquent and urgent." "With a fiercely intelligent listening, Midden reveals Julia Bouwsma’s imagination and research as she investigates the early 20th-century history of Malaga Island, Maine and the devastating state violence against a 'mixed-race' fishing community of white and African Diasporic people who lived there. Bouwsma employs lyric, persona, and lyric narrative to investigate these histories of violent displacement, gentrification, and incarceration. Here 'each page [is] a rupture of self' and the tongue 'becomes the prism / of fracture, land of washed green light―' She reminds us of how porous the bodies of a place and its people are, how loss is written into the bodies of both. When the dead are asked, 'What did you leave behind?' they answer: 'Our arms spread out around it all // until our hands could not / meet our hands.' In Coming to Writing, Hélène Cixous writes: 'If you do not possess language, you can be possessed by it…' It seems to me that Julia Bouwsma has, with imagination and humility, somehow committed her language to such possession. Her work is shaped by the elemental: bonelight, sea, snow, 'mud that will never / wash out of the hem,' her memory’s hem."